It happened in the Netherlands, but it could have been anywhere in Europe. Most of the time, it’s safe to park a car on the street, but that might be different with an electric car charging. Some crazy guy obviously didn’t like to see an electric car plugged on a public charger. 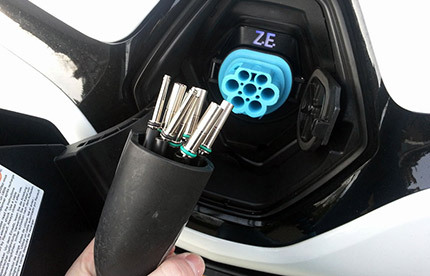 It is theoretically impossible to unplug a Type 2 connector (like this Renault Zoe is using) by pulling it, and this has proven to be quite true. Part of the plug is still stuck on the car, but all the metal parts are gone. The car owner will have to buy a new cable (€500 ; $683), and the car will probably need to be checked by a dealer to make sure nothing else has been damaged. This act of vandalism was reported by AutoWeek, but looking further, the real issue is the location of the charging stations. It might not be wise to install a station anywhere remote, and drivers should not leave their car unattended for long hours.